Lawndale Creek Restoration – Village of Algonquin | ENCAP, Inc. 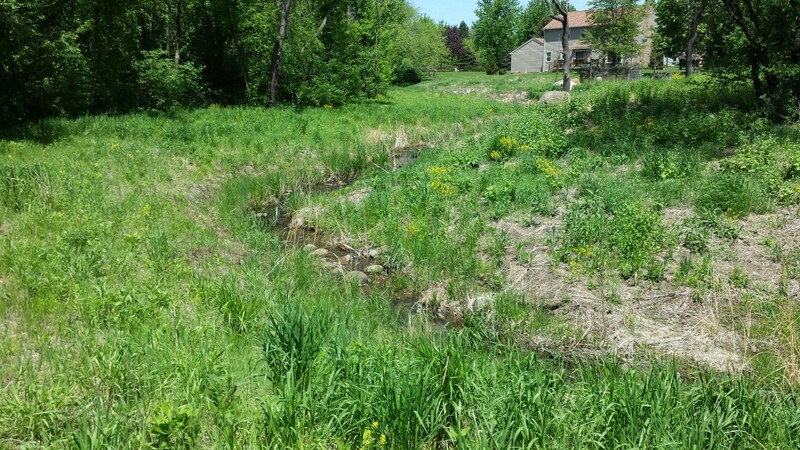 This project involved the restoration of approximately 500 linear feet of streambank and riparian area along Lawndale Creek, a tributary of the Fox River in Algonquin, IL. This highly incised stream was located within a developed and urbanized area on the near west side of Algonquin. The stream had become severely eroded, incised and overgrown with woody invasive species such as buckthorn, honeysuckle, and box elder. The design for the project included clearing, removing, and herbiciding all woody invasive species, construction of boulder and cobble riffles, and stream bank grading and sloping to reconnect the stream to its associated and historic floodplain. The construction, grading, seeding, erosion control blanketing and native plug planting work was performed in the Summer of 2012 between May 30th and June 11th. The project was constructed from downstream to upstream utilizing low ground compression tracked skid steers and small tracked excavators. The work was performed utilizing low flow conditions. As a condition of the USACE permit and Soil and Water Conservation District requirements, flow was intentionally blocked at the upstream limit of the project during work hours to reduce sediment impact to downstream water resources. The excavated materials were spread outside the floodplain and seeded. This work also included planting of native trees and shrubs along the riparian corridor in the Fall of 2012. The site has been under management for invasive species by ENCAP, Inc. since that date. If you require our services for a project like this one, please contact us.